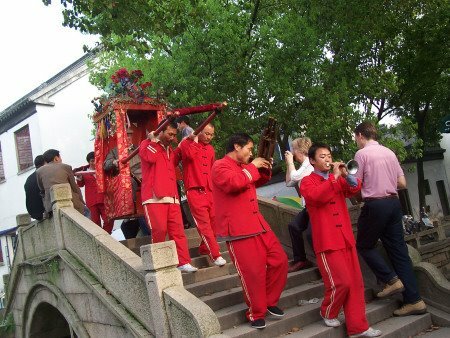 Part 4 -- Yi Cheng - Shanghai - Suzhou - Tong Li - Shanghai. 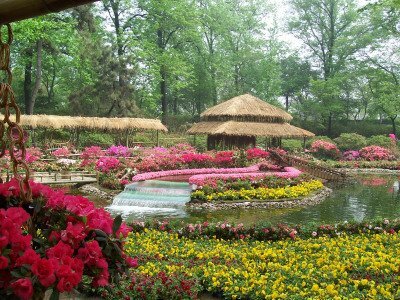 Many amazing sites, lots of photos! After disembarking from the boat (complete with farewell fanfare from the brass band) we drove through the small backwater of Yi Cheng, population 4 million, many of whom are working in some way on the dam project. There's a whole university in this city dedicated to dam studies! It's a dusty, industrial city and the few hours we spent waiting at the airport was a decent chance to rest (sitting around on a boat watching stunning scenery is remarkably hard work), complete with aviation fuel odours. A delayed flight later and we landed in Shanghai, gloriously warm and humid. A short taxi ride to the hotel introduced me to a completely different side of China to anything I'd seen previously. Shanghai is closer to a cross between Tokyo and Paris than to Beijing and it's immediately obvious that this is the centre of big business. Even with the misty night, the lights of the skyscrapers peered through the fog giving a remarkable cityscape. An enormous buffet in the hotel including frogs, river eel, octopus and crab left me with a distinct psychedelia of dreams. In my first year at Southampton University, where I took my PhD, one of my flatmates was a Chinese girl, Sylvia, with whom I chatting and cooked (along with a good Greek friend) most evenings. Sylvia is Shanghainese and so as the others went off to explore the Bund, I was met by Sylvia and her driver and taken to a superb restaraunt. It was lovely to catch up with Sylvia, meet her husband and her very bubbly ten month old baby boy. I was taken aback and honoured to be asked to give her son a Western name. Before seeing him I was rather worried about how I would choose a name but as soon as I saw him I knew that he was a Ben. Once the pronounciation was settled, everyone, including Ben seemed happy with the choice. Unfortunately I'd forgotten to bring the camera so pics will follow when sent from Sylivia. Sans baby, we headed into the Shanghai drizzle to wander around Pudong where you get an excellent view of the Bund, Shanghai's most famous street of stunning buildings, and to enhance this we took a boat ride down the river. 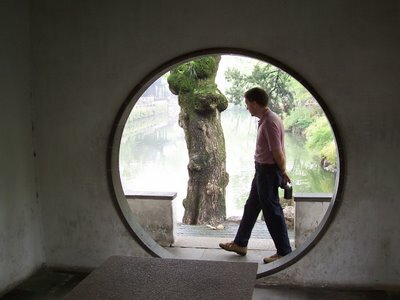 Again a lack of pictures but I can recommend this short trip to anyone in Shanghai with half an hour spare. Due to prior arrangements we departed company after this short excursion and I headed back to the hotel to meet the parents. 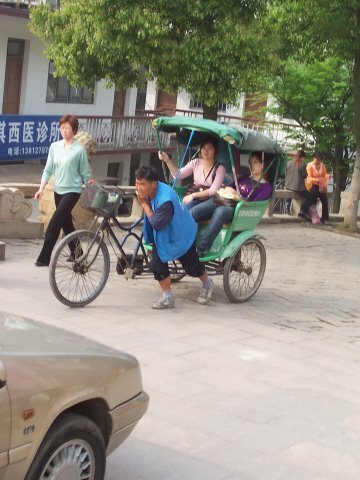 Though I was fine in Shanghai catching taxis as my Chinese is good enough for that and even for the occasional chat with a driver, Shanghainese is remarkably different from Mandarin. Though close in many ways to Mandarin the peculiarities in pronounciation, including swapping some consonants and tones makes it very hard to understand for a beginner like me. From the other's ravings it sounded like I'd missed an exquisite collection of bronzes, ceramics and ethnic clothing in the Shanghai museum but I plan to head back to the city in the near future. Unaware that we would only be staying in Shanghai for a couple of days, with perfect Chinese hosptitality, Sylvia had arrange a house for me to stay in and a driver to see me around the city. It was with great regret that I had to turn down this amazing generosity. The day concluded with Japanese lesson 101. My fellow travellers hadn't sampled a great deal of Japanese food so I did my best to offer a decent cross section from the extensive menu in the hotel. Two hours later and seemingly satisfied customers left the table replete with suitable combinations of sushi, sashimi, tempura, terryaki, wasabi and sake, to retire after cups of coffee and tea had topped off the meal. Early starts were growing a little tiresome by this point but I was happy to continue knowing that there were only a few days left. An early meeting with a less than forthcoming tour guide and speed freak driver started our day trip to Suzhou, reknowned for its fantastic gardens and the grand canal, another ancient Chinese project of gargantuan proportions. Some 2000 years ago the Chinese built a 1700km canal between Beijing and Shanghai, the Chinese don't do things by halves! By this point, the immense figures (a million workers on this project - 2000 years ago!!!) trip off the tongue flippantly as we witness yet another astounding feat of ancient engineering. Incorrect information aside, Ming got us to all the spots we wanted to see, starting off with two of the gardens that Suzhou is world famous for. 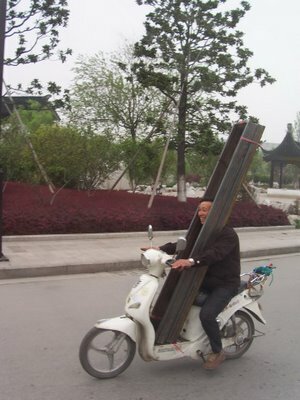 In fact this shot is surprisingly unstereotypically Chinese. 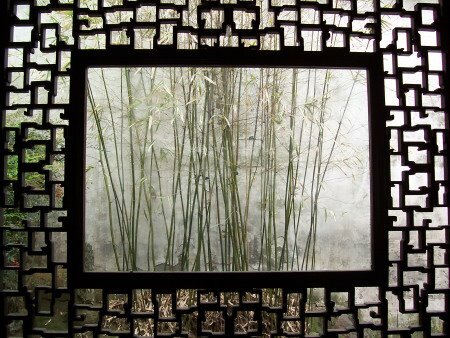 The usual Chinese garden is more simple and understated but at this, the Garden of the Humble Administrator, all guns were blazing on the clash front. M performing his best Bond impression in one of the many moon gates. 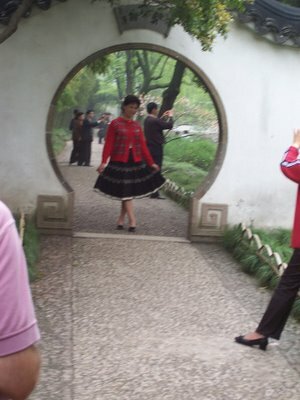 People love to pose for photos here and I managed to sneak a picture of this woman elegantly stood in an arch. 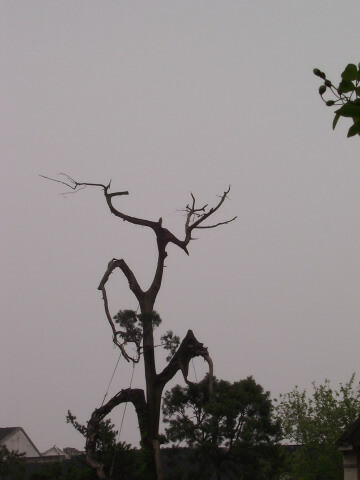 I loved this tree, not shaped like this on purpose but quite unmistakably (at least to my imagination) like a dancing man. and this is one of may favourite shots through an ancient window at the bamboo set against the white walls. Back in the car we passed this biker who grinned from ear to ear as I took his photo. We then went to the silk factory where the silk is provided by the 500,000 local silk worm farmers. They show you the whole process of silk production from the worms themselves through the amazing process of extracting the threads from the crysalis and making the multifibred strands all the way to making silk garments and duvets. Then on to Tong Li, the Venice of the orient, complete with a stinky tofu stand on every corner. A stunning little town and I'm sure that a full day there would take you more off the tourist trail and into Tong Li proper where a couple of hours in a tea-house overlooking the canal would be a rather fine way to spend an afternoon. 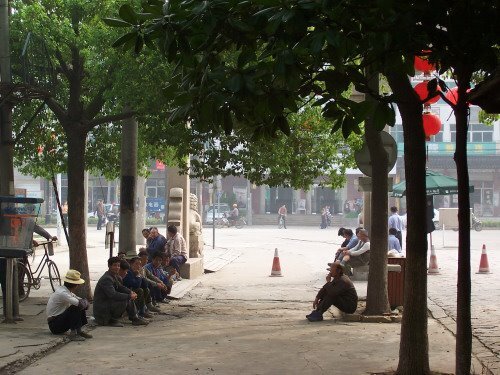 Men sit by the side of the road in the afternoon haze waiting for nothing in particular. My party as they escaped the clutches of the local bank which held up my father and his passport for some time while he attempted to change travellers cheques. They had to run round the corner to find a photocopier in a local shop. For a small fee you can be cycled around the city at your leasure though we opted for the pedestrian approach. 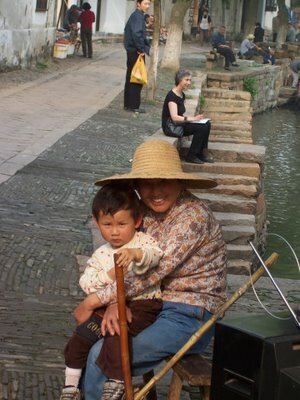 A woman and her child sit by the side of the river watching a comedy show on TV. For a higher price you can be carried on a short tour by sedan, complete with tooting and fluting band making a racket and waking any afternoon dozers. 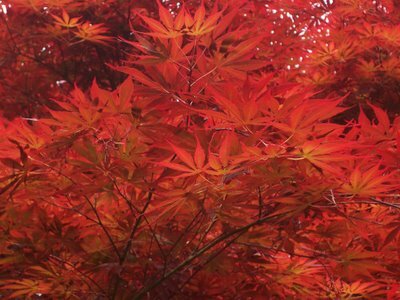 In one of the gardens there was this stunning maple tree with incredible colours. 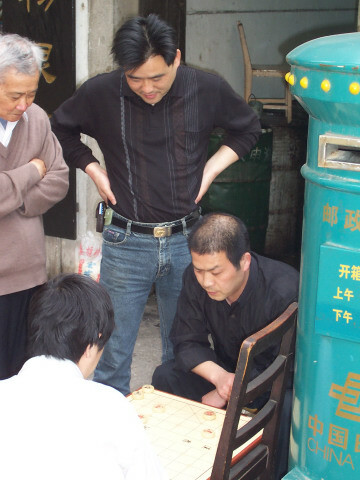 Men playing Mahjong by the side of the road. 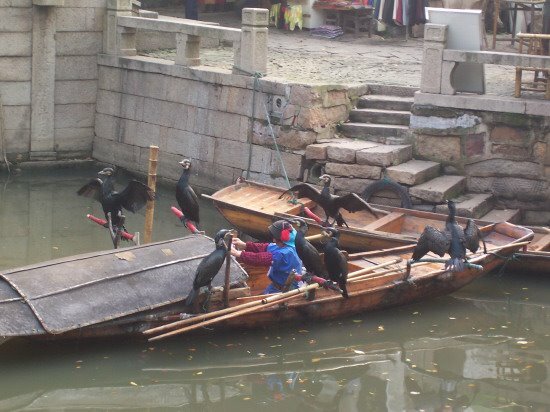 On the canal there is a woman who uses cormorants for fishing. 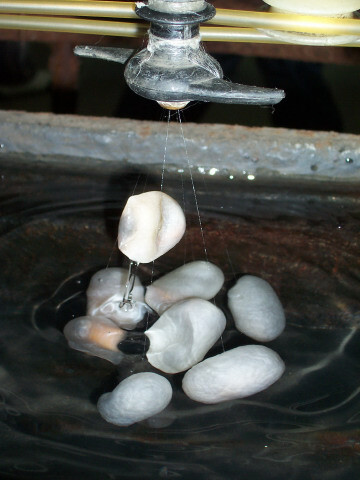 The normal method is to tie a loop around the bird's neck so it can't swallow the fish. The method used in Tong Li was a lot more cruel and I shan't describe it here for the sake of sensitive readers. Anyone who is interested can e-mail to find out. Arriving back a little shaken and jarred from the drive (the speed of which was hidden by a speedo reading a constant zero) a flurry of phone calls were exchanged to arrange another meal with Sylvia and Shelley, another friend from Southampton who'd just flown into town from Hong Kong. From the outside, and to some extent the inside, the restaurant looked to be like a Chinese version of a fast food chain, with plastic and bright colours decorating the interior. However this extremely loud, steamingly hot, bustling restaurant served the most exquisite Cantonese food I've ever tasted. From clams, snails and crab to langoustine, various goose organs and enough vegetables to replant the Gobi, the food came in an endless supply and somehow vanished into the ravenous bellies of the travelled and the mothering. Quickly, stomachs were stilled and weary faces rejuvinated with this incredible fare. Shelley, me and Sylvia after the amazing meal. 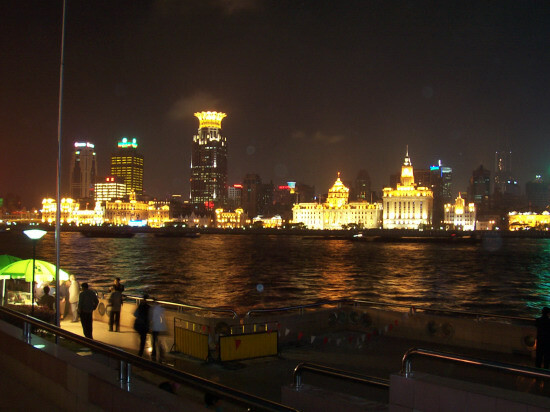 A walk to the the harbour at Pudong gave us a few minutes respite to let the food settle and get a wonderful view of the Bund, the other side of the river in its colonial glory. A hectic but enjoyable evening was a fitting end to the all too short Shanghai stay. 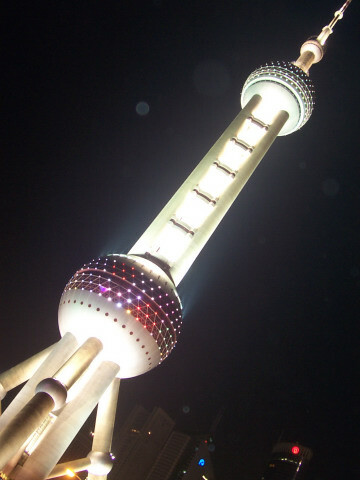 The East Pearl tower is a stunning building lit up at night near to another building that, for a little while perhaps will become the worlds tallest building. I could only fit it in on the diagonal from where we were standing. Shanghai is stunning and there's so much to see. I hardly saw anything of the city itself but really hope to go back there some time to explore in proper detail some of the amazing buidings, parks, restaurants and museums in this hugely cosmopolitan city. 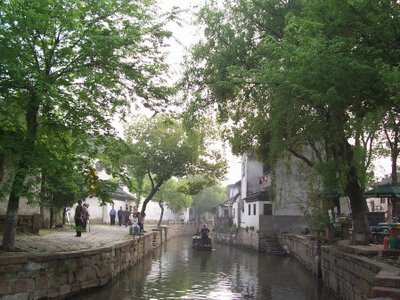 I'm glad you got to visit Suzhou, its really a beautiful and quaint place. My parents live in the SIP (Suzhou Industrial Park) which I doubt you saw, as it is a little removed from the main city. 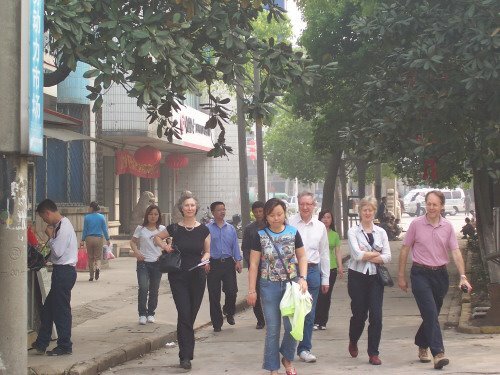 These industrial parks are manicured, Westernized free-trade zones and pretty much China's attempt at encouraging capitalism while maintaining they are communist. :) I love the Humble Administrator and Tong Li. Very nice pictures, they really captured the flavor of the city and made me feel nostalgic! We didn't get to SIP but it sounds like another interesting facet of Chinese modern culture that I'd be keen to find out about.